For medical device manufacturers, selecting the right adhesives and developing the correct bonding procedures—including surface preparation, adhesive dispensing, and curing—are critical parameters in the successful use of joining technology. Joining is one of the key issues in many manufacturing industries, and the medical device industry is no exception. Medical devices are becoming more complex and more sophisticated, both in performance specifications and structural complexity. Whether used outside the body, in the form of instrumentation or surgical tools, or inside the body, for diagnostic monitoring or therapeutic purposes, medical devices typically consist of components and materials that must be joined in some way. Light curing of a radiation-curable adhesive. This article provides an introduction to the use of adhesives in the production of medical devices and reviews the main types of adhesives used in medical applications. It explores surface pretreatment, curing and dispensing techniques, and typical adhesive applications in the medical device manufacturing industry. By chemical type (epoxy, silicone). By physical form (films, tapes, pastes, one- or multipart components). By curing method (e.g., heat curing, moisture curing, radiation curing). By functional type (structural, pressure-sensitive, hot-melt). By end-use function (sensors, catheters, tissue, or bonding). Thermosets, Thermoplastics, and Elastomers. Polymeric-based adhesives can be divided into three major classes: thermosets, thermoplastics, and elastomers. A thermosetting adhesive, as the name suggests, becomes set into a given network, normally through the action of a catalyst—heat, radiation, or a combination of these factors—during the process of cross-linking. As the name suggests, cross-linking is the process of forming cross-links between linear polymer molecules (curing is another term commonly used). As a result of this process, thermosets become infusible and insoluble. Thermosetting resins (e.g., epoxies, polyesters, and phenolics) are the basis of many structural adhesives for load-bearing medical applications, as well as for the precision joining of electronic parts. In contrast, thermoplastic adhesives (e.g., polyamides) are defined as materials that soften, melt, and flow when heat is applied; the adhesives solidify when cooled. Figure 1 provides a simple illustration of thermoplastic and thermosetting polymers. Adhesives may also be based on natural elastomers (e.g., natural rubber) or synthetic elastomers (e.g., styrene-isoprene-styrene block copolymers). Elastomers (e.g., polyisobutylene) are the main polymers used in pressure-sensitive adhesives for producing medical tapes. Figure 1. An illustration of the differences between thermoplastic and thermosetting polymers. Adhesives based on other natural origins (e.g., proteins, cellulose, or starch) are also available and are important for many medical and pharmaceutical applications. Acrylics. There is a wide range of acrylic-based adhesives that join a variety of similar and dissimilar materials. The main types of acrylic-based adhesives are cyanoacrylates, anaerobics, and modified acrylics. A number of medical-grade tapes and films (e.g., single- or double-side coated, woven and nonwoven, elastic, and absorbent materials) are available. They are used in a variety of applications, including allergy patch testing, nicotine patches, ostomy devices, and general dressings. Many of these tapes and films can withstand EtO and gamma sterilization. The ability of this group to undergo a variety of polymerization and cross-linking reactions leads to multiple epoxy resins with a wide range of chemical and physical properties and molecular weights and structures. Epoxies are among the most widely used adhesives for both structural and nonstructural applications. Epoxies are used in a number of medical devices for bonding and sealing. A clear, medical-grade, low-viscosity epoxy adhesive has proven useful in the fabrication of access ports that are implanted beneath the skin of patients who require multiple infusions.7 By allowing access for subsequent treatments, the access ports enhance patient comfort and have been shown to reduce complications. When combined with a catheter assembly, access ports can be used to deliver drugs to a particular area of the body. They can be used for arterial, venous, peritoneal, or interspinal access. One example of such a device is based on potting the stainless-steel or titanium access port with an epoxy adhesive or encapsulant. This particular adhesive passed all USP Class VI biological and toxicity tests (i.e., acute systemic and intracutaneous toxicity, implantation tests, and cytotoxicity tests). Depending on the nature of side groups and the interchain cross-linking, silicones are available in the form of gels, liquids, or elastomers. The most widely used side groups (R and R') are based on methyl (–CH3), phenyl (–C6H5), vinyl (–CH=CH2), or hydroxyl (–OH). Vinyl and hydroxyl groups are chemically reactive and, in the presence of a suitable curing agent, can be cross-linked. A simple and general classification of silicone-based adhesives is shown in Figure 3. Unlike an acetoxy cure, which produces acetic acid and can cause corrosion, a neutral cure (with no corrosive by-products) is ideal for medical electronic applications. Silicones are used as adhesives, coatings, or encapsulants in medical devices. The most important types of silicone used in implants are fluids, gels, and elastomers (rubbers). An example of implantable-grade silicone is a mixture of pure silicon resin (e.g., di-methyl silicon elastomer) and a catalyst (e.g., a platinum catalyst). This mixture can be cured via an addition-cure chemistry at elevated temperatures (e.g., 20 seconds at 160°C). Implant-grade room-temperature-vulcanizing (RTV) silicone adhesives are also available; these adhesives can be cured at room temperature through exposure to ambient moisture in the air. The silicones that have been used in breast implants are gels. These silicones are highly cross-linked polysiloxane networks swollen with polydimethylsiloxane (PDMS). The PDMS fluid is not chemically bound to the cross-link network, but is instead retained only by physical means (like water in a sponge). Pressure-Sensitive Adhesives. Pressure-sensitive adhesives are used in medical tapes and labels. The adhesive is permanently in tacky form at room temperature and can be used to join various materials with the application of moderate pressure. Pressure-sensitive adhesives are not normally used in sustained-load-bearing applications and can often be removed without leaving a residue. Most pressure-sensitive adhesives are based on elastomers (e.g., natural or synthetic rubbers), acrylics or hot-melt thermoplastics, tackifiers, or antioxidants. Single- or double-coated pressure-sensitive adhesives are employed in many medical applications. These tapes are available as woven, nonwoven, or elastic materials; they are compatible with skin and can be easily removed with minimal residue. There are medical tapes and transfer adhesives available that can withstand both gamma and EtO sterilization. Pressure-sensitive adhesives have also been used in transdermal drug-delivery systems.5 This type of system offers many advantages over conventional oral medications, mainly because it delivers less drug to achieve the same therapeutic effects. The transdermal method delivers drugs directly into the bloodstream via skin and then the liver, rather than by absorption in the gastrointestinal system. A transdermal drug-delivery system usually consists of a patch with drug formulations, an adhesive to maintain contact with the skin, a release liner to protect the patch during storage, and a backing layer that protects the patch from external factors during use. Adhesives in Medical Electronics. In the area of electronic components for medical devices there are a wide range of polymeric materials available. They are used variously as attachments, substrates, and interconnections, and for encapsulation or protection. In recent years, the use of adhesives and encapsulants in medical electronics and implantable devices has increased considerably. This is due to the availability of a wide range of materials that offer different properties, better adhesion, improved durability, suitability for automated dispensing, and rapid curing. Typical examples are the use of epoxies in ultrasound catheters and pacemakers and light curing adhesives in medical electronic packages. A general classification of adhesives used in electronic applications is shown in Figure 4. Successful material-joining adhesives normally require suitable surface treatment of the adherents prior to bonding.7 The selection and application of an appropriate surface treatment is one of the major factors for achieving good wettability and improved long-term durability in adhesively bonded joints. Inadequate or unsuitable surface treatment is one of the most common causes of premature degradation and failure. The function of surface treatment includes the removal of contaminants or weak boundary layers and the alteration of surface chemistry, topography, and morphology to enhance adhesion and durability. Surface preparation techniques are generally divided into mechanical or chemical methods. Mechanical methods include abrasion, grit blasting, and shot blasting. A laser technique has also been tried.10–11 Chemical methods include degreasing, etching, and anodizing; the use of adhesion promoters; and flame, corona, and plasma treatments. In many applications, simple degreasing and abrasion is sufficient to provide good adhesion. Medical polymers with low surface energy and bondability, however, require a more specialized treatment (e.g., plasma treatments) in order to provide better adhesion and joint durability. Some adhesion promoters can also enhance the bondability of certain polymers. Recently, new grades of adhesives with the ability to bond polyolefins without pretreatment (e.g., polyethylene) have become commercially available. Mixing. The mixing and preparation of adhesives should be in accordance with manufacturers' instructions. Appropriate health and safety precautions must also be taken. Only adhesives from the same batch number should be used in a single joint to prevent uneven properties. Adhesives should be applied immediately after surface preparation is complete, and applied in such a manner that minimizes the risk of air entrapment in the joint. Manual mixing and application should be avoided, if possible; it can introduce voids, bubbles, and regions of incomplete mixing. Using handheld dispensing guns to dispense single- or multipart paste adhesives from prepackaged cartridges is recommended. For high-volume production, semiautomated or automated pump dispensers should be employed. Component parts of the adhesive are mixed during the dispensing process by forcing them through a static mixing nozzle. When a new nozzle is fitted, or at the beginning of a new production run, a 50–75-mm bead of adhesive should be dispensed onto scrap material to ensure that good mixing is achieved and that any aged adhesive is removed. A supply of energy to the bulk adhesive to move it through feed pipes to a valve or pump, then to a dispensing nozzle. Control of the valve or pump, to vary the volume applied during each cycle. Control of the speed of movement between nozzle and component—either the component or the dispensing nozzle can be moved, depending on the application. There are many methods of dispensing adhesives. Because of cost restraints and processing considerations (i.e., the speed and volume of the adhesive to be dispensed), the techniques considered most suitable are cartridges, pressure/time systems, pumps, and microjet printing. Cartridge Dispensing. Cartridge dispensers may be single or double cylinders, with mechanical or air movement of the pistons. Figure 5 illustrates how applying pressure to the plungers allows equal measures of part A (adhesive) and part B (hardener) to be mixed automatically in the mixing nozzle. The mixed adhesive is then applied to the component as a single shot. Sizes typically range from 5 ml to 1 L. Cartridge dispensing is generally a manual process suited to batch production runs. Pressure/Time Systems. In a pressure-based system a tank is pressurized by air, which drives adhesive through a feed pipe to a valve. A time relay initiates the valve opening and closing, controlling the volume of adhesive dispensed. Adhesives with viscosities up to approximately 10,000 poise can be dispensed. Bulk containers vary from 50 ml to 100 L. Pressure/time dispense systems are suitable for high-volume production rates, in semiautomated or automated processes. Pinch valves or diaphragm valves can be employed to control dispense volumes and to prevent adhesive stringing between components. Pumps. The dispensing of adhesives by pumping techniques can be achieved in a number of ways, depending on whether a one- or two-part adhesive is dispensed. One-part adhesives are dispensed using direct metering extrusion pumps, shown schematically in Figure 6. An electric motor pushes a follower plate into a drum of adhesive, which is then extruded through a hose to the dispensing valve. This technique is used for medium- and high-volume production rates. Two-part adhesives are generally dispensed by volumetric pumps for semiautomated and automated medium-high-volume assemblies. A typical pump is illustrated in Figure 7, which is similar in principle to the cartridge system described above. Metered dispense systems are capable of processing adhesives with mix ratios of 1:1 or up to 15:1. Microjet Printing. One of the most attractive precision dispensing methods for polymeric resins and particle-filled fluids is the use of microjet printing technology.12 This technology is based on piezoelectric demand-mode ink-jet printing, which can produce droplets of polymeric resins 25–125 µm in diameter, at rates up to 1000 drops per second. There are two main material requirements for dispensing by the DOD method. First, the polymeric resin has to be stable and reducible in viscosity to the 0.4 poise level; this is typically achieved by heating or diluting with a suitable solvent. Second, the printed polymer must maintain the required properties for the intended application after solidification on the substrate. Typical 100% solid polymeric materials may be jet printed provided they do not degrade at the elevated temperature at which the required viscosity is reached. For diluted versions of printable polymeric resin, it is essential to select a solvent that does not evaporate too rapidly and thus block the ink-jet head. Polymeric resins containing fillers (e.g., filled adhesives) can also be printed providing they satisfy the viscosity and chemical stability criteria and the filler particle size of <10 µm. Suitable grades of a range of commercially available adhesives can be successfully printed in picoliter volumes with consistency and good printing quality. The microjet printing technique is emerging as one of the most attractive dispensing techniques for many new micro, optoelectronic, and medical device manufacturing applications. Viscosity, which determines whether pumping or cartridges will be used. The curing mechanism. This mechanism must prevent adhesive hardening within the dispenser. The curing time. This must be calculated to prevent hardening in the dispenser. Cycle time, which should fit the production schedule. The volume of adhesive used per cycle and per day. The accuracy required per component. Local heat application at the joints. Laser heating (Nd:YAG or CO2 lasers). There are a range of materials available that can be cured using radiation sources such as UV and visible light. Acrylated resins (acrylated epoxies, polyesters, polyurethanes, and silicones) can be cured using radiation energy. Radiation-curable adhesives or encapsulants generally consist of low- or medium-molecular-weight resins (called oligomers), monofunctional or multifunctional monomers, additives, pigments, photoinitiators, or photosensitizers. A typical UV energy of 80–120 mW/cm2 produced from a UV source (300–400-nm wavelength ) is usually sufficient to cure a UV-curable adhesive within 10 to 60 seconds. An alternative radiation curing technique is to use visible light (470-nm wavelength; see photo on page 58). Radiation curing adhesives are often used for joining clear polymers in disposable and nondisposable medical devices. In general, both UV and visible-light curing can be achieved using light boxes or focused beams and light guides. In some cases heat is also employed to encourage the curing process, for the completion of curing, or to cure areas that cannot be reached by radiation energy. According to the injection and implantation testing requirements specified under the USP biological reactivity tests, in vivo polymers are classified on a scale of I to VI.16 To test a polymer, extracts of the material are generated in various media. The extracts are then injected systemically and intracutaneously into rabbits or mice to evaluate their biocompatibility. Class I, II, III, and V polymers do not require implantation testing; Class IV and VI polymers do require such testing. ISO Standard 10993 consists of 16 parts. Each part describes specific tests that include a variety of toxicity tests. For example, the tests in Part 10 are used for the identification and quantification of degradation products from polymers. Many polymeric adhesives may be qualified as USP Class IV and Class VI materials. These materials can pass the relevant incutaneous-toxicity (in vivo), acute-systemic toxicity (in vivo), and implantation (in vivo) testing requirements. Merely passing USP Class VI standards does not guarantee that an adhesive will meet FDA requirements in a particular application; however, passing the test is a strong indication of the nontoxicity of an adhesive. Certain types of medical-grade epoxy adhesives are capable of being sterilized by autoclaving, EtO, and chemical methods. These epoxy resins can be used in medical devices that require sterilization prior to use. The use of adhesives for joining medical device components has increased significantly in recent years. The selection of suitable adhesives and appropriate bonding procedures—including surface preparation, adhesive dispensing, and curing—are critical parameters in the successful use of joining technology. Although there are many commercially available medical-grade adhesives, thorough investigation is required before they should be used in new applications. It is also important to remember that in addition to determining the initial joint strength, users must investigate the durability of the bonded components in intended service environments (e.g., exposure to low and high temperatures, stress, fluids, or sterilizations). Designing accelerated aging tests that simulate service environments is critical in providing realistic durability data. It is also essential in the performance assessment of medical devices to interpret the aging data and predict the life span of the joint. The emergence of new types of adhesives and the further development of precision dispensing and rapid curing technologies offer many attractive opportunities for joining medical devices. The author wishes to thank material suppliers and users, particularly Loctite UK, Epoxy Technology, Braun Medical, Emerson and Cuming, and Dymax for their support and for supplying some of the photographs for this publication. 1. SB Dunkerton, "Joining of Materials for Medical Applications" (paper presented at Third Annual Medical Design and Materials Conference, Amsterdam, The Netherlands, April 24–25, 1995). 2. SM Tavakoli, EL Nix, and AR Pacey, "Joining Components of a Cardiac Catheter Tip Assembly with Electronically Conductive Adhesives," ANTEC 3 (1995): 3362–3366. 3. SM Tavakoli, "Adhesive Bonding in the Medical Industry, Designing Successful Assemblies—Critical Issues in Joining and Bonding" (paper presented at MEDTEC, Amsterdam, The Netherlands, October 21–23, 1997). 4. G Ciapetti et al. "Toxicity of Cyanoacrylates In Vitro Using Extract Dilution Assay on Cell Cultures," Journal of Biomaterials 15, no. 2 (1994): 92–96. 5. M Rimpler, "Gluing a Challenge in Surgery," International Journal of Adhesion and Adhesives 16 (1996): 17–20. 6. HN Himel, "Tissue Adhesives in Plastic and Reconstructive Surgery," in Surgical Adhesives and Sealants—Current Technology and Applications, chap. 19 (Lancaster, PA: Technomic Publishing, 1996). 7. RH Estes, "The Suitability of Epoxy-Based Adhesives for Use in Medical Devices," technical paper GB-63, Epoxy Technology (Pembroke, MS). 8. SM Tavakoli et al. "A Novel Polymeric Coating for Enhanced Ultrasound Imaging of Medical Devices" (paper presented at ANTEC 2001, May 6–10, 2001). 9. I Webster, "Recent Developments in Pressure-Sensitive Adhesives for Medical Applications," International Journal of Adhesion and Adhesives 17, no. 1 (1997): 69–73. 10. SM Tavakoli and ST Riches, "Laser Surface Modification of Polymers to Enhance Adhesion: Part 1 Polyolefins," ANTEC May 1 (1996): 1219–1224. 11. SM Tavakoli and ST Riches, "Laser Surface Modification of Polymers to Enhance Adhesion: Part 2" (paper presented at ANTEC 2000). 12. DJ Hayes, ME Grove, and WR Cox, "Development and Application by Ink-Jet Printing of Advanced Packaging Materials," in Proceedings of the International Symposium on Advanced Materials Process, Properties and Interfaces (1999), 88–92. 13. WT Pimbley, "Drop Formulation from a Liquid Jet: A Linear One-Dimensional Analysis Considered as a Boundary Value Problem," IBM Journal of Research and Development 29 (1984): 148. 14. DB Bogy and FE Talke, "Experimental and Theoretical Study of Wave Propagation Phenomena in Drop-on-Demand Ink Jet Devices," Journal of Research and Development 35, no. 1 (1989). 15. SM Tavakoli, "Adhesives and Coatings—The Cheaper, Greener, Higher Productivity Approaches to Rapid Curing, Part II," TWI Bulletin 42, no. 1 (2001) . 16. SM Tavakoli, "Adhesives and Coatings— The Cheaper, Greener, Higher Productivity Approaches to Rapid Curing, Part II," TWI Bulletin 41, no. 6 (2000). Figure 1. Bonding components of an ultrasound catheter tip with conductive adhesive. Catheters. Figure 1 shows a silver-loaded, electrically conductive adhesive that is used to join a piezoelectric transducer (PZT) ring to a tungsten carbide (WC) tube. The ring and tube are two components of a cardiac catheter tip, which functions as part of an ultrasound imaging device for the quantitative and diagnostic analysis of coronary arteries. After a series of investigations on the catheter tip, an optimized condition was found. The manufacturer inserted a conducting adhesive between the WC and the PZT components and a curing process was used that resulted in a void-free, 80-µm conducting layer with the desired acoustic properties. These ultrasound catheter tips have been taken through mechanical product testing to clinical evaluation trials. Figure 2. 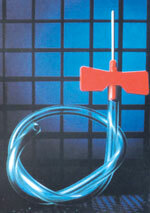 An adhesively bonded balloon catheter. In addition, cyanoacrylates and curing adhesives are used for joining latex balloons onto PVC, urethane, and multilumen tubes for balloon catheters. Figure 2 shows an example of adhesive bonding in balloon catheters for angioplasty. Pacemakers. A two-part, silver-filled epoxy is used for bonding critical components in hybrid circuits within pacemakers. Needles. Lancets, syringes, injectors, hypodermics, blood collection sets, and introducer catheters are assembled using acrylic-based adhesives. The polypropylene moldings of a drug-administration gun are often bonded together using a cyanoacrylate adhesive. Figure 3. Epoxy-bonded end caps on a blood filter. Polycarbonate Devices. Acrylic-based adhesives are used in bonding polycarbonate medical devices including filters, blood-pressure transducers, arteriograph manifolds, cardiotomy reservoirs, and blood oxygenators. Epoxies are also used to join filter components. Figure 3 illustrates the use of a two-part epoxy for bonding end caps to the main tube of a blood filter. Masks. UV-curable acrylic adhesives are employed for bonding cushion (flexible PVC) to nose (rigid PVC) in anaesthesia and face masks. Figure 4. A drug-delivery tube bonded with acrylic adhesive. Tube Sets. Blood and drug delivery sets and suction and IV tubes are assembled using acrylic-based adhesives. An example of the acrylic and PVC components of a drug administration tube, bonded with an acrylic adhesive, is shown in Figure 4.